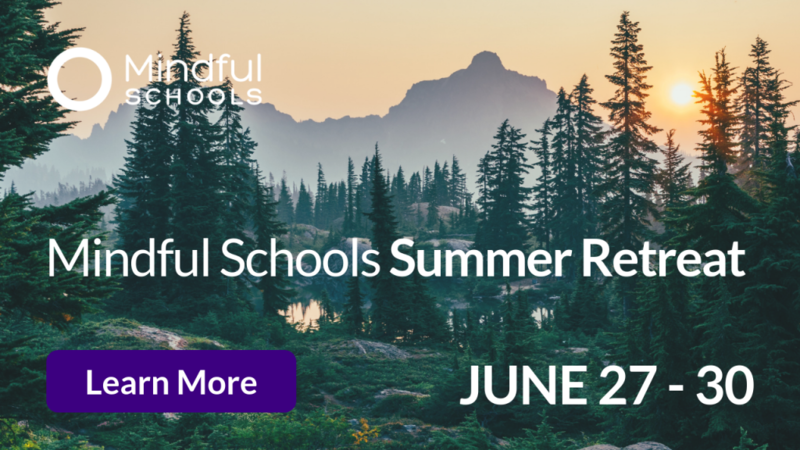 What are the similarities and differences between mindfulness and social and emotional learning (SEL)? How do the two approaches converge or collide? 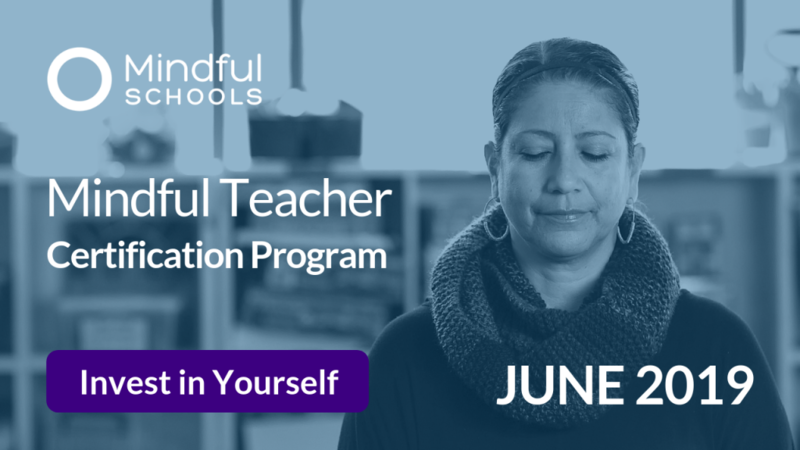 How might integrating mindfulness amplify the effects of existing SEL programs? To address these questions, we first can consider the commonalities and differences in terms of (1) practices, (2) skills and (3) outcomes. Below is a diagram illustrating our theoretical framework. 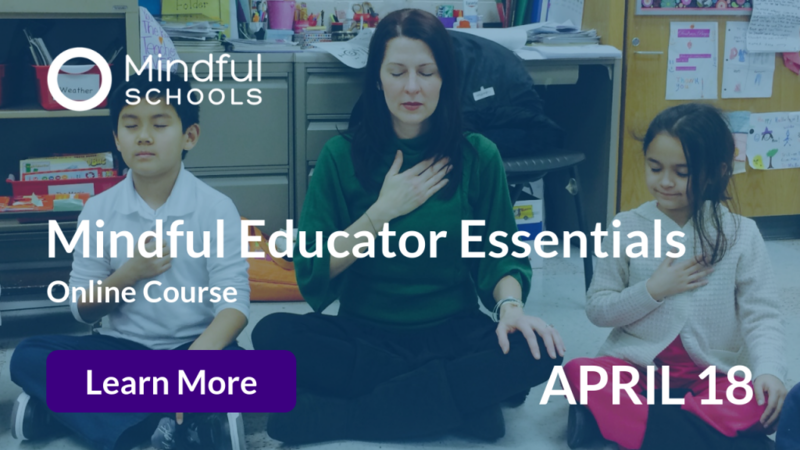 Mindfulness and SEL each prescribe certain practices and psychoeducation (which means discussion of psychological concepts that helps students better understand and regulate their internal life and behavior). These practices develop specific skills that in turn, we hope, lead to beneficial outcomes. Let’s consider mindfulness first. The practices of mindfulness include explicit attentional training. Students are guided in exercises to anchor the attention to simple bodily processes, such as the sensations associated with the breath or ambient sounds. Mindfulness also explicitly develops emotionally positive states including kindness, compassion, and gratitude through practices that evoke and amplify particular emotions. It includes training in regulating our responses to impulses. Mindfulness is a practice of developing equanimity, meaning an ability to let go of reactivity and act from a place of greater ease, stability, and wisdom, rather than compulsively pursuing our preferences. Mindfulness is not only comprised of attentional practices – it also includes substantial psychoeducation. Psychoeducation is a core component in psychotherapy but plays a prominent role in mindfulness-based interventions too. Psychoeducation includes information that normalizes the experience of students and enhances understanding of their internal life and behavior. The practices and psychoeducation of mindfulness are hypothesized to develop specific skills. 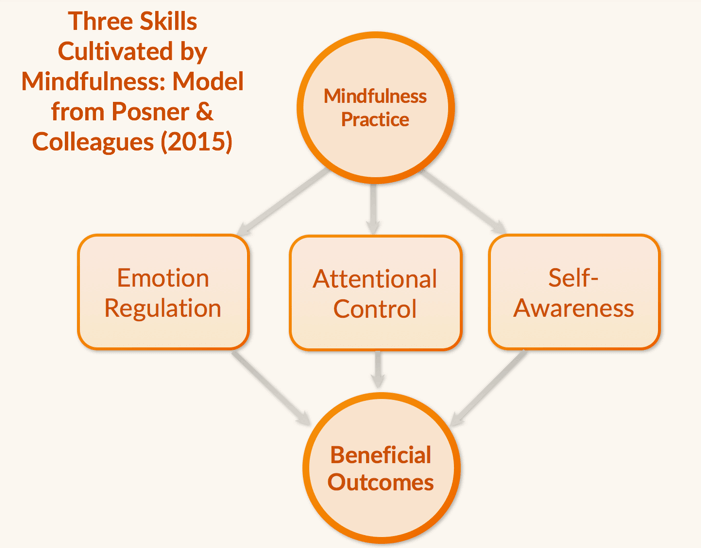 In one prominent model of mindfulness, Michael Posner and colleagues suggested that mindfulness confers its benefits through three core skill sets. Emotion regulation: How we respond to emotion is an important aspect of our well-being. A range of evidence – psychological, behavioral and neurobiological – supports the claim that mindfulness enhances emotion regulation. Attentional control: The regulation of attention is important to virtually all tasks. Mindfulness practice is a training in metacognitive awareness: an awareness of experiences as phenomenal experiences. Metacognitive awareness is opposed to cognitive fusion, wherein we have experiences, but do not appreciate that they are mediated by processes of thinking, feeling and perceiving. In practicing mindfulness, we’re learning to select an object of attention, sustain connection with that object, and come back when we notice we’re distracted. These skills are relevant for academic accomplishment specifically, and goal-directed behavior more generally. Self-awareness: Although the research is more preliminary, mindfulness may confer benefits through the development of self-awareness. Self-awareness includes present-moment awareness of body and emotional cues. It also refers to decreases in narrow focus on oneself and greater flexibility in self-concept. What are the aims of mindfulness and what are its benefits? As a practice and approach to living, mindfulness aims at profound flourishing. Practiced over a period of years, mindfulness seeks to create an emotionally balanced, meaningful life, animated by a spirit of compassion and caring. Now, let us consider the practices, skills and outcomes of SEL. Numerous SEL programs have been developed and include diverse approaches. Nevertheless, we try to synthesize common features here. SEL involves psychoeducation and exercises designed to enhance goal-directed behavior. SEL harnesses the goodwill of students to create an atmosphere of emotional safety. Attitudes of mutual respect and commitment to group cohesion are reinforced. SEL teaches and models behaviors related to emotion recognition and regulation. It provides tools for resolving differences by developing greater emotional intelligence and communication skills. Practices of perspective-taking aim to develop empathic connection and prosocial behavior. Tools and psychoeducation regarding decision-making attempt to minimize impulsivity and reduce destructive behaviors including truancy, substance use and conduct problems. The value of learning is reinforced and the importance of social-emotional skills for successful adaptation is highlighted. The exercises and psychoeducation of SEL is hypothesized to develop specific skills. 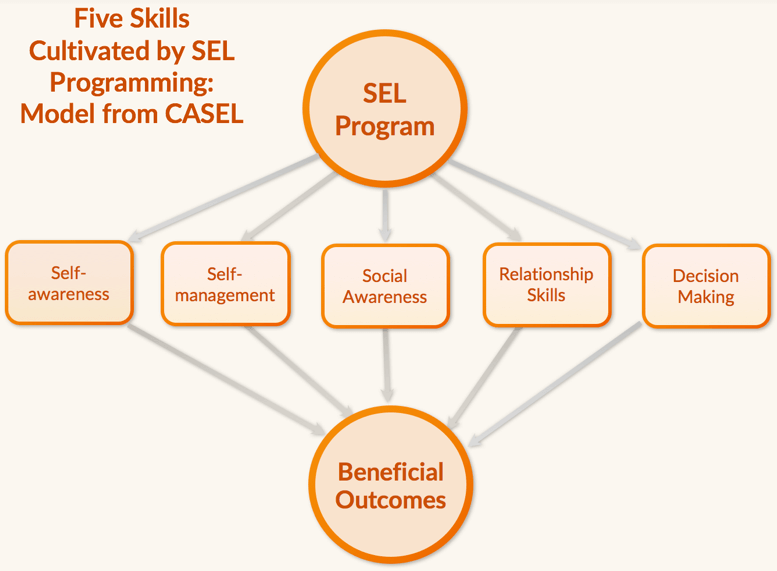 The Collaborative for Academic, Social, and Emotional Learning (CASEL), the leading voice in the codification and dissemination of SEL programming, highlights five core skills through which SEL confers its benefits. The diagram below highlights the five skills. The description of these skills is derived from CASEL. Self-awareness represents students’ ability to recognize their own emotions and understand how their interpretations of their experiences influence their behavior. Self-awareness includes recognizing their personal strengths and weaknesses and feeling a sense of efficacy. Self-management refers to the ability to regulate thought, emotion and behavior in the different contexts of a student’s life: school, home, work and social situations. This skill includes stress management, impulse control and the capacity to organize activities to achieve long-term personal and academic goals. Social awareness is the capacity to empathize with others, including others with whom one does not share the same background or culture. These empathic abilities allow students to explore how to relate with others in an ethical way. Relationship skills refer to a suite of interpersonal capacities: communicating clearly, listening effectively, resolving conflict and maintaining healthy relationships. Responsible decision-making means that students develop the ability to make choices on the basis of ethical standards and considerations of social norms. It entails the ability to reflect on the consequences of actions and accurately weigh the implications for oneself and others. The skills developed by SEL programs are in service of particular outcomes. In an important review of more than 270,000 students receiving SEL programming, researchers highlighted five key outcomes of SEL programs: 1) healthy attitudes, 2) positive social behavior, 3) reduced conduct problems including substance use, 4) reduced emotional distress and 5) improved academic performance. The researchers found that universal SEL programs, delivered by classroom teachers, demonstrated benefits in all five key outcomes. These benefits were considered small but meaningful. Of special interest, academic performance was improved by 11%. The foregoing analysis has highlighted the practices, skills and outcomes key to mindfulness and SEL approaches. Clearly, there is substantial resonance between the two approaches. Many mindfulness programs include or explicitly incorporate aspects of SEL. Now, we turn to differences between the approaches. Comparing skills: While the skills of the approaches have considerable overlap, SEL more explicitly focuses on creating harmonious classrooms and communities. Mindfulness invests heavily in developing self-regulation. 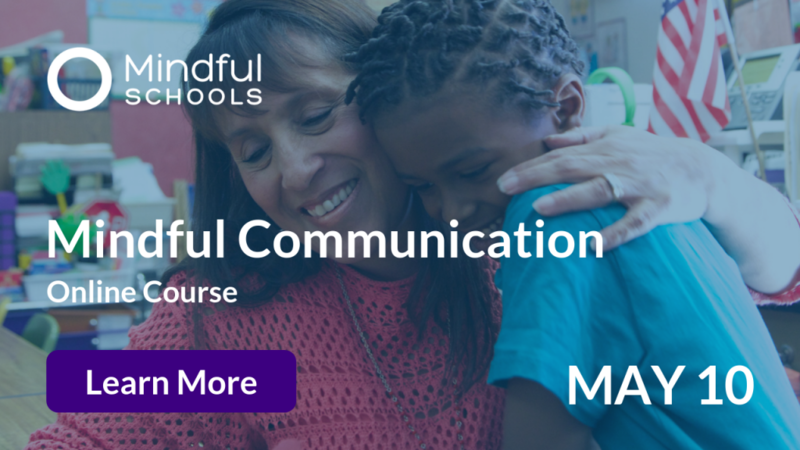 This directly supports the first two SEL skills – self-awareness and self-management. The interpersonal and decision-making skills emphasized in SEL are distinctive. The self-regulatory development within mindfulness likely has benefits for relationships, but mindfulness does not intend to provide concrete skills in the manner SEL does. Comparing outcomes: Inspecting the target outcomes of mindfulness and SEL, again, we find overlap and notable differences. First, the orientation to goals is different. Mindfulness is arguably less explicitly goal-oriented. Mindfulness instructors are hesitant to specify the particular outcomes that mindfulness can induce. Productivity and fitness for adult life do not fully guide mindfulness implementations. Of course, in mindfulness research and programming, primary and secondary outcomes must be specified. Nevertheless, explicit emphasis on particular desired outcomes can undermine the unpressured, investigatory spirit of the practice that is at its core. SEL more clearly specifies the desired outcomes: prosocial behavior, emotion regulation and academic performance. SEL is also more likely to specify long-term outcomes regarding success in adulthood. 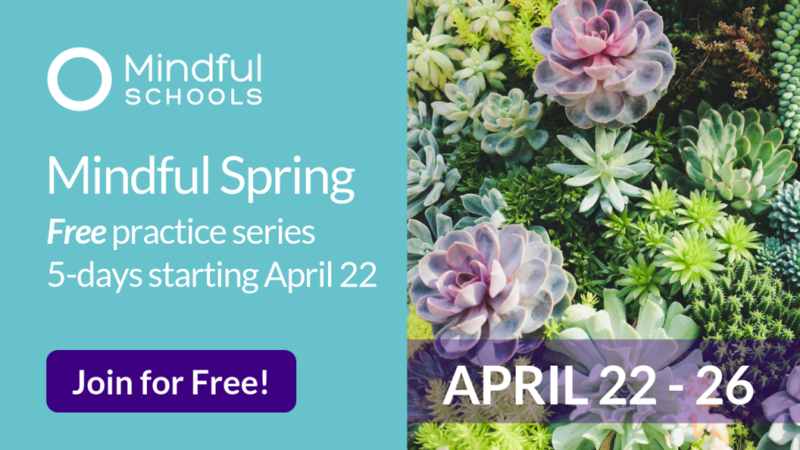 How Might Mindfulness Support SEL Programming? When experts develop, test and disseminate a program – mindfulness, SEL or another – it is not uncommon to develop deep personal investments in one’s own particular approach. Additionally, program developers compete for limited resources: funding, classroom time, teacher energy and leadership support. These factors can create a sense of zero-sum game, where a win for one program is considered a loss for another. 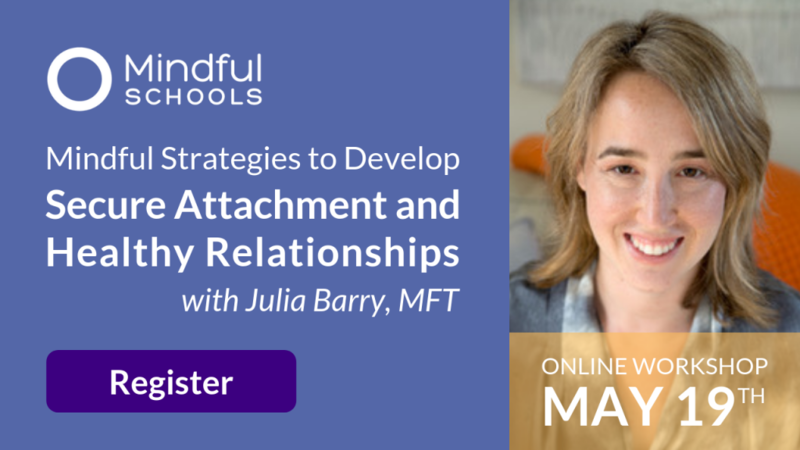 We hope that mindfulness and SEL can transcend this dynamic and the most effective elements of each approach can be incorporated and leveraged for greatest benefit. As our expertise is in mindfulness, here we suggest the rationale for incorporating mindfulness into existing SEL programs. Of course, an equally good case can be made for incorporating SEL into mindfulness programs. The formal practice in mindfulness is directly relevant for SEL’s first core skill: self-awareness. From one perspective, mindfulness is simply a way of approaching the question, “What is it like to be human?” The busyness of our activity obscures experience. The pause of mindfulness simplifies experience enough so that we can bring clarity and equanimity to the experience of being human. When we get quiet and attend to the flow of experience, we can’t help but learn. Equanimity is a foundational skill in mindfulness practice. Within SEL programs, equanimity serves broadly as a resource for reducing impulsivity and promoting goal-directed behavior. We suggest that formal mindfulness practice cultivates equanimity, thereby serving important outcomes targeted by SEL programs. A substantial body of research suggests that mindfulness improves emotion regulation and pain tolerance. Providing concrete skills to enhance these outcomes is likely to potentiate SEL effects. The attention training aspect of mindfulness is likely to be relevant for academic achievement. Mindfulness decreases mind-wandering, which is associated with poorer task performance. Experimental evidence suggests that enhanced attention can improve reading comprehension and improves cognitive capacities. Lastly, we suggest that mindfulness may be beneficial in promoting the prosocial attitudes and behavior that form a centerpiece of SEL. The classic description of empathy – ‘to stand in some else’s shoes’ – presumes that we already know what it is like to stand in our own shoes. With striking clarity, mindfulness reveals what it’s like to struggle and suffer, to delight and to love. The intimacy of our encounter with ourselves provides a deeper basis for accurate empathy. Recent data support this hypothesis. Mindfulness and empathy are also linked through their shared relationship with stress. While mindfulness decreases stress, stress weakens empathy. The suite of practices including kindness, compassion, gratitude and joy are also relevant for prosocial outcomes. Some studies have examined the effects of mindfulness on altruistic behavior and uncovered positive connections. Neurobiological data offer preliminary but plausible explanations for the observed effects of mindfulness on prosocial behavior. We have highlighted the rationale for incorporating mindfulness into SEL programming. 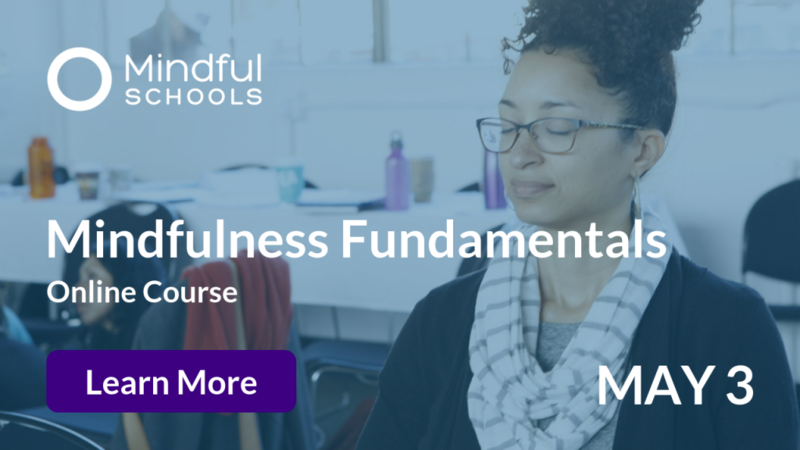 The practices, skills and outcomes of mindfulness and SEL are largely complementary. Their commonalities make them good partners, while their differentiation suggests that one approach can profitably be integrated with the other. Developing protocols that intelligently blend the practices, skills and aims would be a worthy endeavor. Bäuml, J., Froböse, T., Kraemer, S., Rentrop, M., & Pitschel-Walz, G. (2006). Psychoeducation: a basic psychotherapeutic intervention for patients with schizophrenia and their families. Schizophrenia Bulletin, 32 (suppl 1), S1-S9. Goyal, M., Singh, S., Sibinga, E. M., Gould, N.F., Rowland-Seymour, A., Sharma, R., … & Ranasinghe, P.D. (2014). Meditation programs for psychological stress and well-being: a systematic review and meta-analysis. JAMA Internal Medicine, 174(3), 357-368. Dahl, C.J., Lutz, A., & Davidson, R.J. (2015). Reconstructing and deconstructing the self: cognitive mechanisms in meditation practice. Trends in Cognitive Sciences, 19(9), 515-523. Desbordes, G., Gard, T., Hoge, E.A., Hölzel, B.K., Kerr, C., Lazar, S.W., … & Vago, D.R. (2015). 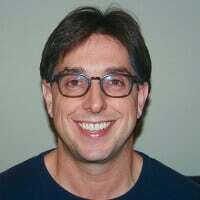 Moving beyond mindfulness: defining equanimity as an outcome measure in meditation and contemplative research. Mindfulness, 6(2), 356-372. Gross, J.J. (2002). Emotion regulation: Affective, cognitive, and social consequences. Psychophysiology, 39(3), 281-291. Lantieri, L. & Zakrzewski, V. How SEL and Mindfulness Can Work Together. Greater Good Science Center. http://greatergood.berkeley.edu/article/item/how_social_emotional_learning_and_mindfulness_can_work_together#, Retrieved November 21, 2016. Mrazek, M. D., Franklin, M. S., Phillips, D. T., Baird, B., & Schooler, J. W. (2013). Mindfulness training improves working memory capacity and GRE performance while reducing mind wandering. Psychological Science 24(5),776-781. Randall, J.G., Oswald, F.L., & Beier, M.E. (2014). Mind-wandering, cognition, and performance: A theory-driven meta-analysis of attention regulation. Psychological Bulletin, 140(6), 1411-1431. Singer, T., & Klimecki, O.M. (2014). Empathy and compassion. Current Biology, 24(18), R875-R878. Weng, H.Y., Fox, A.S., Shackman, A.J., Stodola, D.E., Caldwell, J.Z., Olson, M.C., … & Davidson, R.J. (2013). Compassion training alters altruism and neural responses to suffering. Psychological Science, 24(7), 1171-1180.